Sterling silver, real Lapis, and White Agate. 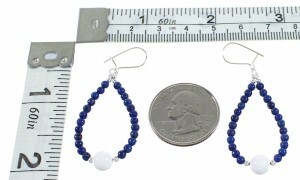 Hook dangle earrings measure approximately 2-1/8" long (including hook) and 7/8" at widest point. This is a wonderful piece of Navajo artistry! This piece of Native American jewelry is Navajo hand strung out of genuine sterling silver, along with real Lapis and White Agate beads. 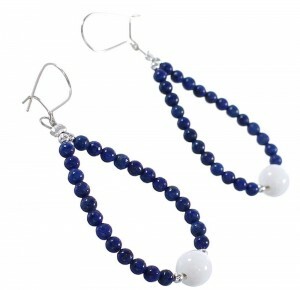 The earrings consists of: 2-mm silver round beads, 3-mm Lapis round beads, and 6-mm White Agate round beads.